And they deserved a hand, as it were, for a strong finish after blowing a 13-point fourth quarter lead as Derrick Rose showed his old form scoring the team’s last six points and Joakim Noah and Pau Gasol combined as a closeout fortress to hold off the Hornets. “(Rose) played hard throughout the night,” said Bulls coach Tom Thibodeau. 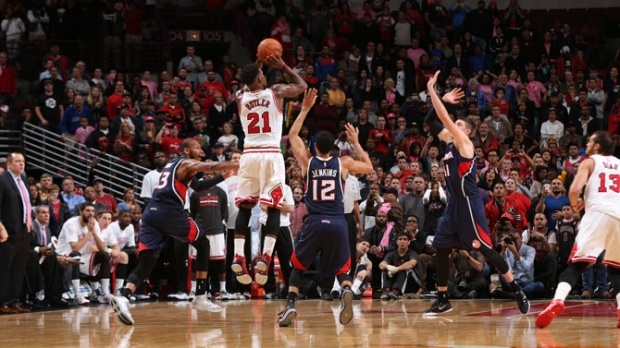 “Kirk (Hinrich with a team-high 26 points on 11-of-14 shooting) obviously played great, too. Pau (Gasol) played very well. We are moving in the right direction. I thought (Mike) Dunleavy played a terrific game as well. The stats don’t only reflect his shooting (one of six), but also his rebounding (nine) and defense was very good. Aaron (Brooks with 13 points in 15 minutes) gave us a big start off the bench. Derrick looked comfortable out there, so we wanted to build him up. He is practicing great now so that is good. There are just two preseason games left, so Sunday’s was significant for the Bulls. They will play the conference favorite Cavaliers and LeBron James Monday on the Ohio State campus. But even though it is James and the Cavs, it probably won’t be as vital. That’s because it’s the second of a back-to-back. So it would seem unlikely the starters would play quite as much given Rose played his first fourth quarter minutes of the preseason Sunday and almost 28 minutes with considerable demands down the stretch. Noah also played more than seven fourth quarter minutes. Plus, Jimmy Butler sustained a sprained thumb in the first half and did not return to the game after playing about 11 minutes. It seems unlikely he would play Monday. Plus, you don’t exactly want to show your main division rival that much with the Cavs in the United Center Oct. 31 for the home opener. — Rose was the closer. With the Hornets playing their starters down the stretch as well and closing within 95-91 on a Michael Kidd-Gilchrist three-point play with 2:21 remaining, Rose took over. The question after two years out with surgeries and not playing much offense for USA Basketball this summer was whether Rose could do so again. The Bulls went exclusively to isolations and two man games featuring Rose. First, Rose took a screen from Dunleavy, drove, crossed over against Kemba Walker and was fouled and made both free throws for a 97-91 lead. After a Lance Stephenson score, Rose drove and lost the ball as the offense basically flattened out against the baseline. That’s when Kidd-Gilchrist scored another three-point play on the fast break to get within 97-96 with 90 seconds left. Rose then took a Noah screen, dribbled over and in to 18 feet on the left side and nonchalantly pulled up to make it 99-96 Bulls. The Hornets missed with Gasol grabbing the rebound. The Hornets then triple teamed Rose as he penetrated. Rose passed out giving Hinrich an open three he missed. The Hornets missed a long three, Rose rebounded, was fouled and clinched the win with two more free throws. Rose had 17 points, nine in the fourth quarter in his first fourth quarter play in the preseason. — Noah and Gasol finished. It can change based on circumstances, but in the first closeout situation of the preseason with regulars playing regulars, Thibodeau inserted Gasol to replace Taj Gibson with 4:42 left and the Bulls leading 90-86. Gibson had become the regular finisher last season for Carlos Boozer, but with the acquisition of four-time All-Star Gasol, the question was who would be on the floor at the end. It appears for now Noah and Gasol as both also were in pick-and-rolls with Rose down the stretch. — The veteran reserves will have to be the glue for the second unit. Hinrich and Brooks both shot well and were the sparks for the best bench effort of the preseason. Hinrich’s shot has looked much better all preseason. On Sunday, it almost was unerring as he was six of seven with a pair of threes for 15 points in the first half and five of seven for 11 points in the second half, primarily pulling up off screens or in transition. Someone finally clean those goggles? Overall, the Bulls bench had a 56-34 advantage as Gibson added 10 rebounds to equal Gasol and three blocks. Gasol also had 15 points and two blocks. Kidd-Gilchrist, who also showed an improved shooting touch, and Stephenson, who showed a similar psychological imbalance with various antics, led Charlotte with 14 each as the Hornets showed they’ll be a difficult team with much improved shooting from last season. Neither Gerald Henderson nor No. 1 pick Noah Vonleh has played in the preseason because of injuries. The worst news for the Bulls was Butler’s sprain as he was trying to make a second consecutive steal in the first quarter. That was following a steal and slam dunk that gave the Bulls an 18-17 lead as Rose and Noah departed with about five minutes left in the first quarter. Thibodeau said Butler, who was leading the team in scoring in the preseason but had just two points Sunday, would be reexamined Monday as the team left for Ohio after the game. No team can afford injuries to its primary players, but the Bulls are not strong on the wing with Tony Snell the apparent backup shooting guard. Snell played 10 minutes and was hesitant once again. Thibodeau tried Doug McDermott with Dunleavy one time and it was quickly taken advantage of by the Hornets on a Stephenson blow by. Butler has thus become a crucial player because of the lack of depth at that position. Thibodeau started the second half with Hinrich playing with Rose. But the Bulls know Hinrich isn’t a long term solution there going on 34 in January. His shooting in the preseason has shown his effectiveness with the proper rest. “We are getting closer to the real deal so I’m assuming we are going try to get our rotations down,” said Hinrich. The Bulls went to Rose to open the game after playing into Gasol in the post with an offense that was operating more smoothly to start. Gasol even made a three and Noah and Gasol worked the ball well to one another. The Bulls then had a big finish to the first quarter on Hinrich’s shooting, though they won’t want to count on that too often. The Bulls led 35-28 after one quarter on 70 percent shooting. It was encouraging against a good defensive team, though not so defensively against what’s been a low scoring, poor shooting team. The reserves had their best effort taking over with Rose and Noah going out and eventually extending the lead to 48-30 four minutes into the second quarter before the starters began to trickle back into the game. Gasol made some nice spinning moves in the post and it appears he’ll be taking up for the offensive drop from Noah as the Bulls are going to him more. Butler didn’t return then in his regular rotation and was declared out for the game, though he stayed on the bench. The Bulls led 57-51 at halftime and then built their lead to 83-70 after three quarters as Rose and then Hinrich and Brooks outplayed the Charlotte guards. But the Hornets came back against the younger reserves early in the fourth quarter as Snell, McDermott and Mirotic were in and the Hornets cut the Bulls lead to 87-85 with about seven minutes remaining before both coaches played it serious to close. The Bulls went to 4-2 with their fourth straight preseason win. Now it’s on to visit the Cavs and LeBron.